I’m going to try this year to post monthly summaries and plans for my reading. Such thought-provoking reads. But, I’m already behind on reviews. I started reading Sudden Fiction International: 60 Short Short Stories edited by Robert Shapiro and James Thomas. I enjoyed the first seven stories and look forward to working my way through the anthology. 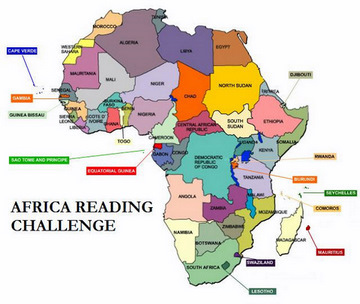 I announced the Africa Reading Challenge and I’m very encouraged by the response. I entered eight reading challenges. I’ll add a couple more this month and officially enter the Africa Reading Challenge, which sounds a bit like cheating! How was your reading in January? What are your plans for this month? I wanted to know what you think about The History of Love. As for Evening is the Whole Day by Preeta Samarasam, I want to read that too. That was my country of birth, so I like to catch up anything that is written by my local writers. I love monthly wrap-up myself, it puts my reading in perspective. You did well in January, Kinna. My reading is getting on slowly because of work and the kids, but I intend to pick up speed this February and read at least three that I selected for the challenges. By the way, I’ve not ready any of books above. Interesting Kinna. You’re not that far behind. I read The Book of Chameleons but was deceived by the blurb. Shouldn’t have read that first. Looks like you did some good reading in January. I enjoyed reading Evening is the Whole Day which I read a few years ago. I didn’t know much about Malaysia so that was interesting (and a good storry). I’ve also signed up for more challenges than I was planning. Must check out the African challenge (help! ).